I began to feel ill on the way home from New York in the summer of 1977. Shortly after I got back, my skin turned ocher and my eyes a brighter yellow. This was jaundice, a symptom of hepatitis. Needless to say, the disease left me feeling exhausted much of the time, and required that I do quite a few things differently. The biggest was giving up alcohol. I've been sober since Oct. 9 of that year - a process which, as memory of the precise day and the absoluteness of cessation suggest, has not been easy. However wretched I felt, there were things I had to get done. The biggest of these was the symposium series. 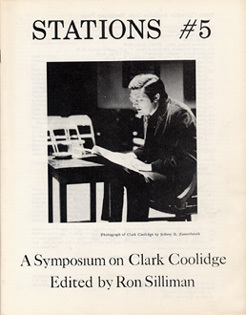 The second tier was made up of symposiums on Clark Coolidge, edited by Ron Silliman; on Ted Enslin, edited by John Taggart; and on Tom Phillips, Ian Tyson, and Joe Tilson edited by Kevin Power. The Coolidge/Silliman was by this time significantly off schedule, and in need of the most urgent attention. In New York, under Tom Montag's insistence, I had told people that Margins would save itself, even though it seemed to be floundering. He told me not to worry about it when I got back from the East Coast, and said he was making good progress on setting the type on Coolidge. I was uneasy about this "progress," but given my illness, also wanted to think everything was going okay. I've gone through my correspondence with Silliman in preparation for this essay, and not only find that it provides a chronology of how things progressed, it also includes some interesting points I hadn't remembered at all, some of them windows into the scene of the time and the way I and a number of people did things, and about the triangulation that I've discussed in these essays. Since the situation required more correspondence on logistics, the letters reveal more of what was going on than those related to the last two symposiums. It's an od irony that if there had been more problems with them, the corespondence involved would have revealed more about the time. One aspect of the letters that I find pleasant (as is the case with others I've read for other installmenst of this project) is that they tend to be long and often digressive. They are clearly before the time when I spent hours every day talking on the telephone, and long before the days of e-mail. They seem to reflect a smaller literary scene. They certainly chart a less hyped, less desperate, less domineering, and more open milieu. In the first letters, written in April, 1975, I proposed the symposium, we go over some basic logistics, and go through approximately two years of discussion of the work in progress. This does not include instructions from me or getting my approval for anything. Ron, like the other editors, had nearly complete control over his own project. The discussions of the symposium always include discussions of poetry in general and our own writing in particular. Despite the cordiality of the letters, and Ron's bringing in the symposium copy precisely according to the schedule I originally suggested, there is growing annoyance on both our parts during the second year as Tom does not get the issue completed. 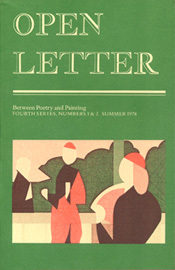 In a letter dated August 31, 1977, Ron writes that he is angry about the delays in the symposium, mentions consulting a lawyer about it, and then, having done some minor saber rattling, proceeds to comment on a reading he had done a couple weeks before with Barbara Einzig, and comments on John Taggart's doctoral dissertation on Louis Zukofsky, part of which I had published in Stations, and other friendly notes such as make up the bulk of the correspondence. In my reply, dated September 6, I bark back re the lawyer and related annoyance. More important, I've talked to Tom who's confessed that he had indeed found himself unable to continue with Margins months before but was afraid to tell me.I offer Ron four options as to how to proceed with the symposium from here: 1, The one I want to do: to publish the symposium as an issue of Stations. 2. There are several people talking about taking over Margins, and I suggest that if Ron would prefer to wait and see what happens with them, we can go that way. 3. I was going to try to place the other two completed symposiums elsewhere, and could try for the same with this one. And, 4. If he wants to try to find another publisher, he can pursue that option however he likes. I don't mention the illness, and given the early date on the letter, I may have been in the process of getting tests done at the time of writing. I do muse on a few events happening among other poets. Aside from the rather formalized bark, the general tone of this letter is more upbeat than I would have otherwise remembered. I speak, for instance, enthusiastically about the project being just between Ron and me at this point, and hence capable of escaping all the delays that had plagued it for the last year. In Ron's reply, dated September 12, he comes across as feeling relief at the log-jamb being over. He definitely wants to go with Stations, and even offers to help place other symposiums. He specifically mentions Enslin, not as much out of enthusiasm for Ted's poetry (though that's not absent) as with Taggart's editorial ability. He doesn't mention the projected Zukofsky number, though he may have had that in mind. The next group of letters deals with handling corrections on type and other logistics. Although I don't go into it in any detail, this was a period when I was frustrated about the future of the series, and particularly about how to handle it given my medical condition. Managing the withdrawal from alcohol was one of the most difficult things I've had to do in my life, and it's a bit strange reading these letters that were gliding over the surface of current problems. The first symposium problem is simple mechanics. Given the health and time situations, I decide that printing the issue myself would take too long and would require either massive and typo-causing rearrangement of type or printing the book in 8 x 10 inch format. With the assistance of David Wilk, I find a printer in Larimore, North Dakota who'll do the job in an edition of 1,000 for $200. This isn't as cheap as it would be now, though it was a bargain for the time. This will be the only book to come forth with my imprint between 1972 and 2000 not printed on recycled or salvaged paper and not printed on my own press. It is, however, something we can get done in a time frame adequate to Ron's needs and to mine. This works out very nicely, despite such perhaps predictable farcical problems as the edition initially being sent by the printer to an address in another state, having to be shipped back to Larimore and then to Milwaukee. Your whole distribution structure makes a great deal of sense: it's as complicated & thot out as anything I've ever seen a small press publisher do. Good to see you don't take anything "for granted". That's the only way to get business done, finally. These letters also chart the beginnings of the magazine whose title everybody hates to type and I just refer to as "el equals ay equals awthehellwithit" (a magazine which I didn't think much of as far as its contents went, though I did contribute at least one article to it). Ron also discusses the setting up of the Segue distribution system, which carried the symposium as well as other books I published for a number of years. As initially conceived, Segue was an extreemely good distribution system. Clearly, however much alternative publishers of the time did not accomplish as far as getting books around to a large audience or to get enough money to fund our projects, our failures had nothing to do with lack of intent, effort, or imagination. By the time the symposium was published and passed around as well as we could manage, a number of things had changed in Milwaukee. The Water Street Arts Center was moving toward its descendent, Woodland Pattern. Part of this process involved the thing I most wanted to achieve by going from an unfunded attempt at utopian community arts organization to part of the state bureaucracy had come to pass: we had money to pay readers to come from different parts of the country and the world. Up until this time, we had sponsored local readings, and had managed ad hoc readings by visitors who had reason to come to Milwaukee or vicinity anyway, so transportation costs didn't matter. Part of the change was brought about by Karl Gartung, originally hired as a manager, who grew into the job to the point where it eventually became his own show. We arranged to move out of the Theater X building where the parent organization had started into a new building on Locust Street, which the org would eventually own. We set up readings for the autumn and spring to avoid travel problems in winter and the heat and vacation schedules of summer. Karl and his wife Anne Kingsbury invited, arranged for, and billeted approximately half the readers, and I did so for the other half. To the extent we could, we set up something like a coalition with other reading venues in the midwest. The Body Politic in Chicago and The Walker Art Center in Minneapolis were our most frequent partners, though there were half a dozen others that worked with us on a less frequent scale. Each of us could pay a reader x dollars for the reading. One would pay for transportation to the general area and another for the trip back home. Getting people from one city to another usually meant a drive between Milwaukee and Chicago and bus or train transport to or from Minneapolis, Detroit or some other midwestern city, though these trips, too, were sometimes accomplished by car. At times, we could pool the resources of more than two venues for the longer transportation expenses. The x dollars the reader received at any one place may not have been lavish, but if the reader appeared at three or more venues, he or she made a tidy enough sum, and usually somewhere along the line found other perqs in the host cities. When this reached its highest point in the early 1980s, we had readers for virtually every weekend during half the year. The Chinese foods I could cook ahead of time, the Mexican food my partner Mary Anne made, and Anne's barbecued turkey became such standards that readers came expecting them and discussed them with other readers, former or prospective. I would have liked to have seen this continue after I attempted to resign as vice president in 1984, and particularly after 1990 when my resignation was finally accepted, but since I wasn't there by the latter date, and no longer had much influence on the practicalities of the organization. I asked Ron if he'd like to read as part of our series. He agreed. We then had about a year of logistics to negotiate. The fussing included such oddities as trying to determine the date of Easter and exactly where Ron would read. We finally settled on April 13, 1980. Ron managed to set up several other stops for himself during the trip. The place for his reading here would be the Milwaukee Public Library - in part because the library was one of our main sources of funds; in part because Karl, a number of other people, and I were renovating the new building. At the precise time of making the arrangements for the reading, Karl and I were sanding the geological striations of junk, linoleum, and God knows what all else from the floor of the middle room. bpNichol read several weeks before Ron and had also stayed with me. My partner of the previous 6 years and I were in the process of going our separate ways and I was in the first phase of a new relationship. But Susan liked bp, and she was going to miss him and a number of other literary friends after she left. She did want to see him, and didn't start packing till the day he left. Ron got here just as Mary Ann started moving in. As with everything else in this chronicle, other events were always going on at the same time as the readings and publishing, though not always as dramatic as the transitions of the spring of 1980. It also meant that Ron and I did a bit less socializing than other readers during that season. Ron's reading went very well, I thought. Perhaps there were advantages to reading in the library, since some people who otherwise would not have come casually wandered in. Unlike several other library readings, none of them interrupted or made any other kind of disturbance. Like many other readings, this one lead to others, by Ron and by friends of his. Ironically enough, Clark Coolidge read on my last full weekend in Milwaukee, and now appears elsewhere in this issue of Big Bridge. Triangulation can carry on into infinity - and irrelevant though curious details. Young is undoubtedly the most widely known of the three. Karl was one of the very first poets to understand the potential of computers and the internet as a mechanism for enabling the creation, distribution and archiving of poetry. 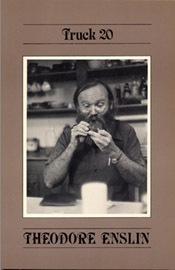 His Light & Dust Anthology of Poetry is the grand-daddy of web poetry archives & remains a great resource. It was Karl who originally invited me to edit a special issue of Margin[s] on the poetry of Clark Coolidge, which more than anything made me conscious of the value of being able to talk & write critically about new modes of poetry. Karl�s own poetry is diverse in mode & impulse. And while he might be more famous today if he were to hone in on a single mode poem around which to build a brand (I�m actually being serious when I say that), what�s really kept him from becoming the household name he deserves to be has been that he�s reserved his great energies to promote poetry, rather than to advocate for Karl Young�s poetry. That�s a generosity of spirit that should never be discounted. I assume there is some blog hyperbole in this, but it hits quite a few nails precisely and succinctly on the head - and gives me some external confirmation of what I was trying to do with the symposiums at precisely the time I can use them. If this editing gig was indeed what made Ron conscious of the value of being able to talk & write critically about new modes of poetry, I achieved one of my main aims in the series, and in Stations before it, in at least one instance. It's also curious to note that although Ron gives my generosity more credit than it deserves, he has described my attitudes - in the symposiums, in other editorial and publishing ventures, and in writing poetry - more succinctly than anyone else has done so far. With the Coolidge symposium, I was able to observe and indirectly take a small part in the beginning of a movement without letting it define me. I don't know if I would have become more of a household name if I'd cultivated a marketable signature style, but I do know that despite disappointments (such as the premature end of the symposiums), I've been able to explore more ideas and make contact with more people as a lone pluralist than I could any other way. During creative periods, I've worked in as many modes as possible, sometimes pushing their divergence when the part of my psyche wanted to stay put. On the one hand, the idea of creating a brand gives me the deep creeps. On the other, editors and publishers who constantly move away from centralizing tendencies toward greater pluralism don't get many kudos for it, and I gave up looking for them a very, very long time ago. But at this moment - January 2006 - when I have qualms about writing remembrances which include self congratulation and perhaps excessive dwelling on things that have disappeared from the world, it is nice to see my efforts confirmed from an unexpected source. I'd like to think that this not only reflects Ron's generosity, but also my good luck and good judgment in asking him to edit this symposium three decades ago. My situation with the symposiums at the end of the summer of 1977 was difficult. Knowing that Tom was not having an easy time of it, and that he had spent too long on the Coolidge symposium, I had, during the last year, moderated my pace in getting symposiums started, hoping that several potential influxes of money and perhaps moving to a country house from the Whitford's and its attendant urban circus would put some new wind in Tom's sails. None the less, two more were finished, and I had four in various tentative stages, plus, of course, grand plans for the larger series. Once I knew that Margins was dead as far as Tom was concerned, and that if new editors did take it over I probably would not have the free hand Tom had given me, I had unpublished work to place. Not only did I have to arrange for its publication, but felt called upon to get the authors a deal comparable to what they'd had with Margins. Perhaps curiously, individual reviews that were not part of the larger project proved most difficult. It took me over a year to place the last of them. It didn't take long to arrange to publish the Coolidge symposium myself, and David Wilk agreed to do John Taggart's Ted Enslin number as an issue of his Truck magazine. The Phillips / Tyson / Tilson number was immense, and I thought I'd have a great deal of difficulty with it. bpNichol wanted to run it as an issue of Open Letter but would have to clear that with the other editors. It did go through when they decided to make a double issue of it. This tier had moved out from the last to include the formative phase of a new movement that was still unsure what to call itself when commissioned, another on people pulling visual poetry out of the shadows of Concrete, and one on a master who stuck to himself. I had been a little disappointed that Ron had not included any comment on Coolidge's involvement with music in his symposium. From the current vantage point, however, it may have been appropriate. This is not what Ron and other younger poets influenced by Coolidge picked up on, and since the symposiums were supposed to be oriented more toward where things would go than where they had been, even in the instances of an even older generation of "subjects," it seems appropriate enough. The last two symposiums took different tones and approaches. There wasn't anything particularly dramatic in getting them done and their progress does not include interesting stories. That they were published by Wilk and Nichol, however, seemed a further triangulation. Taggart's Enslin symposium took a brief and at time astringent look at a highly prolific poet. It may be that Ted is someone who should, as the old phrase goes, let the work speak for itself, with John's comments providing a brief introduction to Ted's extended monologue. When I began the Phillips / Tilson / Tyson Symposium, I was most interested in Phillips. I'd seen plenty of books produced by Tyson, and admired them greatly. It's important to note, though, that most of what I had seen was either shown to me by Jerry Rothenberg or Jackson Mac Low or found in library special collections. I don't think too many poets in America were familiar with them. I had not proposed Tilson, but Kevin Power had the good sense to use the freedom I offered editors as an opportunity to include him. It's also interesting to note that Power was as wildly expansive as Taggart was tightly restrained. But the most important thing with this symposium is that I wanted to present the first entry for visual poetry in the series with more than one poet, and more than one basic approach to the genre. This semed absolutely essential after the homogenity and monomania of Concrete. Virtually all Avant-Garde movements of the 20th Century had had a vis po component in their early phases. It had been an integral part of the two Futurisms, for instance. Even the adamantly oral Beats had had Kenneth Patchen and Wallace Berman in their early stages. A few movements such as Lettrisme had gone the other way: beginning primarily with sound poetry and film, growing vis po out of them, and then becoming dominantly oriented toward visual poetry. Thus the genre cut across virtualy all movements, and was usually characteristic of their first bursts of energy and creativity, though this mode of working tended to be dropped as the movements moved towards orthodoxy and the desire to assume a central position in the arts. When the Brazilian Noigandrans and North Atlantic Fluxists joined forces in Concrete, they had, on one hand, linked North Atlantic culture with the Third World for the first time on an equal footing. But on the other, they had sought a single "look and feel" for everything they did. Since this look and feel was simplistic, easily imitated, and something that looked easy to do, it created an instant and superficial fad that became a prisoner of its homogeniety. The homogenity of Concrete as presented in its definitive anthologies left the reader no room to move or breathe freely. Superficial imitations abounded for a few years. Then everything related to it was rejected with a stronger sense of revulsion on the part of the overwhelming majority of readers than any other genre of the 20th Century. I felt that it was essential to do whatever possible to break out of that. Philips and Tyson, and then Tilson, shared some basic assumptions, and they lived in geographic proximity. But there was enough difference between them to move away from the basic characteristic of Concrete, which Kenneth Rexroth, a sympathetic critic, summed up perfectly by saying, "once you've seen one, you've seen them all." At the time of the symposium, there was very little work by Phillips available, and the only way you could see anything in color was if you could go to his shows in Europe or were lucky enough to have someone pass slides on to you. As much attention as he has received in the last two decades, it may be a little hard to understand how rare his work was in the U.S. in the 70s. It's also important to realize that much of his most important work had not yet been done. A fair number of people outside the circles of visual poets simply associate Phillips with a device as used in a single book. This is unfortunate since all sorts of other people - including Doris Cross, Jonathan Williams, Ronald Johnson - were using virtually the same device of creating a new text by blocking out parts of one that already existed. It's also unfair, in that the device itself isn't anywhere near as important as the skill with which Phillips has used it and the compendium of styles and strategies he has employed to block out areas of text. Still, by whatever means, Phillips created an audience for himself in a genre that was otherwise almost completely suppressed during visual poetry's darkest decades, and he may have acted as either a wedge figure in opening up some room for people who came after him or at least someone who kept some sort of visual poetry available through the later 1980s and 1990s. At present, visual poetry seems to be spreading more rapidly than any other genre. This despite the fact that it is not the property of any specific movement or coterie, though some have tried to make it their private preserve. There's a certain amount of illusion in its seeming growth, since a fair amount of what's widely available now has been circulated through the mail art network for decades, and has only become widely visible as a result of the internet. However, the internet's heavy dependence on graphics also acts as a stimulus and provider of opportunity for new participants. The fiasco of Concrete has faded enough for some people to actually want to try the dead end of isolated minimalism over again. Even if they do force another collapse by doing so, or if freer forms fail in a way analagous to rigid minimalism, the internet will probably not allow the exclusion of the genre to be as severe as it has been. Phillips remains one of the major figures among aficionados and practitioners as well as the more general audience. Nearly any direction visual poetry may take from here, Phillips will certainly be part of it. Not only is he one of the two or three most widely respected North Atlantic visual poets of the last decades of the 20th Century, he provides bridges to the art, and his status will probably continue to grow into the indefinite future. My next tier would have si,ultaneously included my first moves back into an older generation and a step into greater unusualness. Charles Doria had agreed to do a Charles Olson issue, and Gerard Dombrowski had started on a symposium on Bern Porter. I had several people as tentative editors for issues on Louis Zukofsky and H.D. and was trying to find someone to co-edit a Ray Johnson issue with me. (Watch out for confusion of names here: I had I had been thinking of Ronald Johnson as a potential editor for the Zukofsssue, and as subject for an issue to appear, say, five years later, so that the triangulation would become more complex. Bear in mind that Ray and Ronald Johnson are separate and unrelated people.) I wanted to get a Gary Snyder number in this tier, but hadn't yet discussed it with anyone. The Ray Johnson number would have been difficult to pull off. If I had found someone who could have gotten it through to Johnson that these symposiums weren't just about their subjects, it might have helped. Even his almost inevitable attempts to sabotage the symposium, in this case, might become part of the rituals of rejection that acted as a dimension of his performance art. Perhaps fortunately, Doria had only photocopied a couple pieces that had been previously published, and Dombrowski had not gone beyond the planning stages. Of course, if these had progressed further and I'd had to find someone to publish them, it's too bad the editors hadn't moved faster. It might not have mattered much in the case of Olson, but there's still precious little Porter crit out there, and there may never be much. Looking back at the last months of 1977 and the beginning of 78 seems particularly odd now, since I have thought of that as a period in which nothing happened other than spending a lot of time in a stupor, and learning enough Latin to write the book Should Sun Forever Shine. One of the accomplishments of the time was one that didn't occur to me until later: When Margins sank, I got everyone in my charge onto another ship. Since then, I've seen all sorts of editors commission work and not see it through to publication. I don't know if standards of integrity were stronger at the time or if they have declined since or if my work with Margins was unusual. Whatever the case, I'd like to see it as a demonstration on how to honor commitments which other editors should follow, even if they have to do so with difficulty and while in ill health and ill fortune. Letting go of the series was not easy, and I'm not sure how many years it took me before I stopped looking for another magazine to pick it up. I was still checking in the early 80s. The fact that such a collection as I imagined never came to fruition adds to the mass of projects in the world that were well begun but never completed. How many other young people have started such projects and been unable to finish them? How many have never had the chance or the confidence needed to start them? What kind of scene would we have now if such potentials could be fulfilled? Perhaps it's better just to remark on the way such highly improbable entities as Margins get started and give those involved the chance to feel optimistic for a while. And to be amused and gratified by the odd and for a few years delightful vortex in the basement of a demi-mansion where two professors and a nurse gladly supported the efforts of a farm boy whose poems brought him into contact with some highly eccentric friends, allowing him to create a large, and certainly the most pluralistic, review journal the country has ever seen.